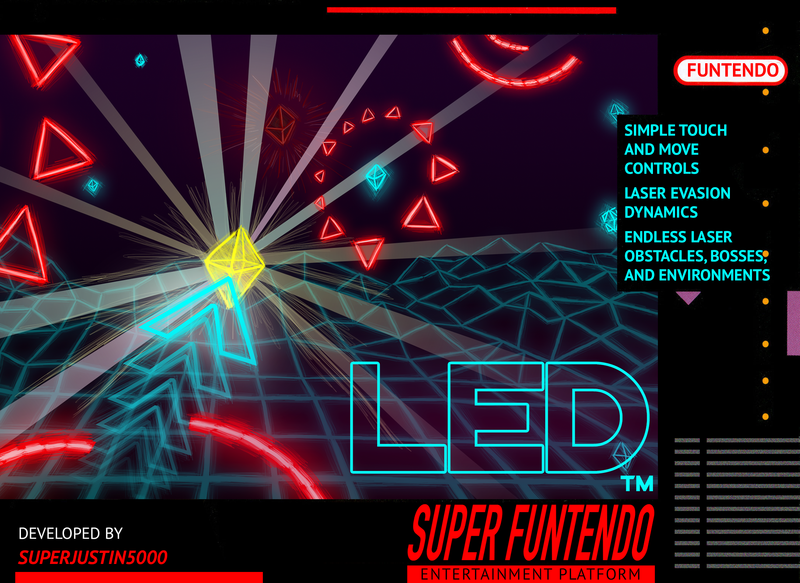 A beaming gauntlet of 100+ high-speed, skill-testing laser obstacles. Brilliantly rendered laser environments. Touch to beginning swiping and dashing your arrow in the direction indicated, and prepare to dodge lasers like never before.THIS GAME GETS DIFFICULT. Simple and addicting touch-and-move Controls. Permanent score multiplier that ensures higher scores the more you play. Multipliers on top of your permanent multiplier. Multiple unlockable songs by Night Runner. -What is your first gaming experience? Some of the earliest I can remember come to me at around 6 years old, when the SNES and Genesis started the original “Console wars”. I remember watching my brothers play games like Mortal Kombat, Punch out!, Excite Bike, and of course almost all Mario games. That’s definitely where I got my start. I spent so many hours on Super Mario World back then. I like to call it the golden age of video games, where they first started really taking off on home consoles. And it’s great to be able to say that I was a part of it. -What got you into programming games? For so long, I can remember that I’ve wanted to make games. And before I learned to program I was closer to being a game artist than a programmer. I always found myself drawing characters, making up worlds, game rules, you name it. The first time I tried to program was in 2003, I had bought a book, Teach Yourself Game Programming In 24 Hours, but I was 15, it was C++, and I couldn’t quite wrap my head around it. Fast forward a bit. It was in 2009 and I had just bought my first iPhone, it was a 3G. That’s when I found out how big independent games were on the app store and I “heard the call”, so to speak, haha. Around that same time my older brother, Chris, had also started programming iOS and Mac Apps, and we’ve always been the type to get each other into the same things we’re currently into. So I started teaching myself with online tutorials, and I’ve been hooked with developing and learning more ever since. -What development tools or coding have you used? When I first started coding games for real, it was on iOS, and I used Cocos2D. Since I had no idea how to program in OpenGL, I knew I would need a game engine, and Cocos2D was perfect for iOS game development. I tried many different things over the years, learning new languages, game libraries. About a year and a half ago, I decided to sit down and learn Unity. Now I’ve been almost exclusively using Unity ever since, and it’s what I used to make LED. -What hurdles did you have making LED? What are you working on next? Lots of hurdles, haha. It’s a lot of work trying to develop games, while going to school full time, having a girlfriend, and some kind of social life. There were a lot of times where I coded for over 12 hours at a time. Other programmers will tell you the same, when you have a feature in your head, it’s extremely hard to move away from the code until you’re done implementing it. Aside from time, I have zero marketing experience, so I was totally lost trying to figure out how to get others to find out the game I’m making even exists. And I think that’s still mostly the case. 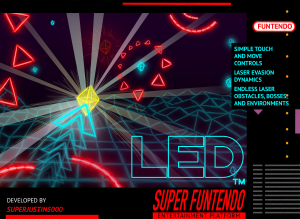 I released LED – Laser Evasion Dynamic on November 19th last year, and I spent a few weeks marketing and taking a break before taking on another project. Over the holidays, I was able to kick around a lot of idea, and eventually, went back to an Game I started making over 3 years ago called Super Sky Hero. It was actually on Kickstarter, a complete unfunded failure by the way, haha. You can find it at https://www.kickstarter.com/projects/superjustin5000/super-sky-hero . Now it’s getting completely overhauled, and it’s coming along nicely. I’ll change the name at some point as well. -Anything you would have changed, now that LED is released? YES! I would completely get rid of the Free-with-ads model. I somehow convinced myself it was what successful mobile games had to do to make money. It’s kind of funny because I hate ad and in-app purchase driven game design, so much I even wrote a paper on unethical game design for a class, but I somehow tricked myself into using it, haha. So yes, I would change that mainly. -What other games have you made? Well I already mentioned Super Sky Hero above, even though the project was never finished, although I’m doing my best to turn that around. I actually made my first game back in 2011, and it was released on iOS. I’m actually not allowed to take credit for it since, after I made it, I sold the code, the art, and all the rights to “creator-ship” to another individual. Let’s just say it was a fast paced twist on pong, with an attempt to throw in a story. Aside from that I’ve been involved in plenty of game jams, my favorite being the 2015 Global Game Jam, and you can check out the game my team made here : http://globalgamejam.org/2015/games/orbital . -Any advice for other indies? Don’t be afraid to show off what you’re working on. Do it often, and do it early in development. If no one knows your game exists, it will be that much harder. Also, any feedback that isn’t coming from family or friends is invaluable. People on the internet aren’t afraid to tell you what’s bad, and you’ll be able to fix it sooner rather than mull over it for months and then never be able to take out a bad feature. One more thing, let others actually play it. One of the biggest problems I found is that when making a game, it doesn’t take very long for you as the developer to master every mechanic, so it’s very hard to judge what’s too difficult too easy. You need that feedback from players. Lastly, don’t give up. There were plenty of times when I wanted to quit, and I came very close, but just keep opening that project and put a little more into it. You’ll make it. -How can I play your game, LED – Laser Evasion Dynamics? –My favourite computer was my Amiga and console the Megadrive do you have a favorite? I have to say when it comes to favorites, I can’t decide between the SNES and the original Playstation. Both consoles gave me some something I haven’t had since. SNES gave me so many of the what I consider the greatest games ever made, as well as some unforgettable memories growing up. And the Playstation was the first console that I got that was all my mine, that I didn’t share with friends or my brothers, my first game for it being Spyro the Dragon, which I absolutely loved. It also had Metal Gear Solid, the Resident Evils, and Final Fantasy 7,8,9, FF8 being probably my favorite game in existence. So actually, I would have to go with the PSONE. No, the SNES! Actually, can someone out there make a console where you can play SNES and Playstation games in one console? Put it on a crowdfunding site, I’ll definitely back it. -What is your favourite retro game? I mentioned before my favorite game is Final Fantasy 8. However it may just fall outside the range of retro. I’m thinking NES/SNES, and if that’s the case, the first thing coming to mind is Super Metroid, and there’s nothing I can say here that hasn’t been said about it somewhere else. -Do you still game on current consoles if so what’s your favourite game? Not as much as I would like honestly. School and game development take a lot of time away from being able to play them. The most recent I remember were The Last of Us and Bioshock: Infinite. Both were awesome games, but I have a bias toward Infinite, since the first Bioshock is one of my most favorite games. -What’s the worst game you have ever played? –Finally what game or feature would you like to see on Retrogamesmaster in the future? Definitely more indie developer interviews like this. It’s great to see their perspective on things. I like that a lot of the things you cover are not just the really popular things that every one else already covers also. Maybe do some stuff on retro games that are very obscure or never even released like Star Fox 2 on SNES.